A Memorial Garden for "Man's Best Friend"
Anyone who's ever loved a dog can relate to this touching memorial planted by Bruce Cartwright in Cambridge, Massachusetts. Bruce wrote us and shared the story of losing his dog, "Tyler" and how the bright spring tulips he planted in Tyler's "favorite spot" brought back great memories and some joy this spring. Last fall I purchased some Darwin Hybrid tulip bulbs from American Meadows. I mixed your mix with your mix. 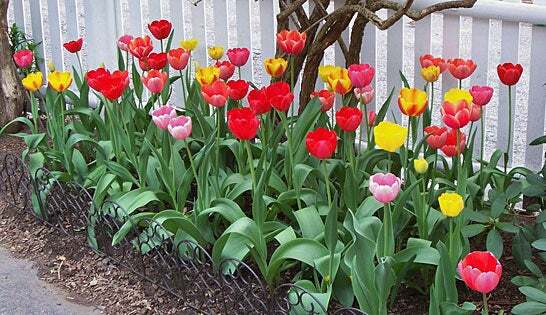 And by the way, "Plant to Impress" is a fitting name, since my neighbors have been full of compliments about how gorgeous the tulips look this spring. Anyway, sadly, at the end of last summer (2008) I lost my longtime dog and friend of 12 years. He was a very special dog, and he had a very special place-his favorite spot in the yard to sit back and relax. So I decided to plant a memorial garden next to his "spot" in the yard, a special little garden in memory of my dog, Tyler. I wanted to make a big splash, so I planted around 70 bulbs close together. Well, I couldn't have asked for better results as far as the amazing display of tulips that bloomed in my dog's memory. I highly recommend that customers buy this combo. It can be a nice way to remember a loved one that is no longer with us. If people think they look great in the picture they looked even better in person.